It was another warm sunny day in Baton Rouge. Don’t know the actual high but think it was 91 this afternoon. The weather is just repeating itself each day and we aren’t complaining. Yep, that’s the same opening as yesterday with an increase of one degree. We were all sort of tired this morning but were anxious to see what we could get done today. 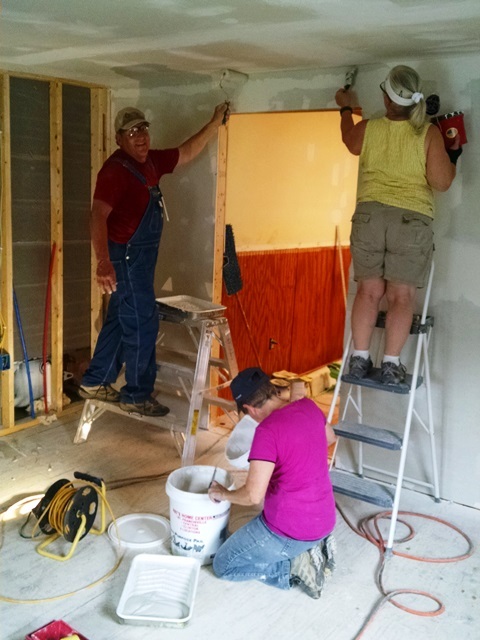 Anne, Mark, Carol and Stel returned to work on bedroom and bath #2. The bedroom walls were textured, the closet and bathroom were primed, along with the bedroom ceiling. 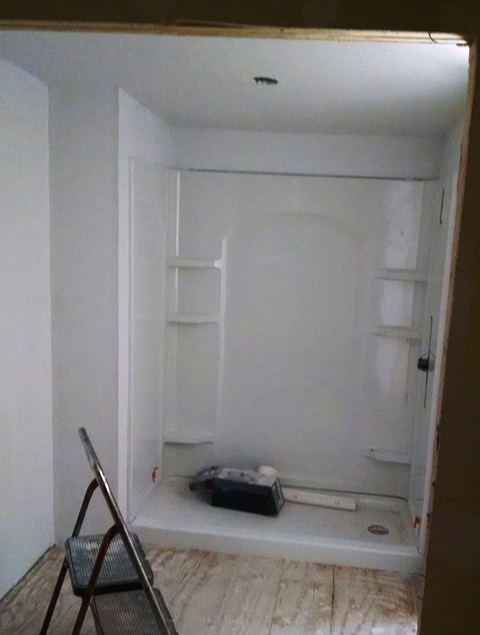 The ceilings in the bathroom and closet also got a final coat of paint. 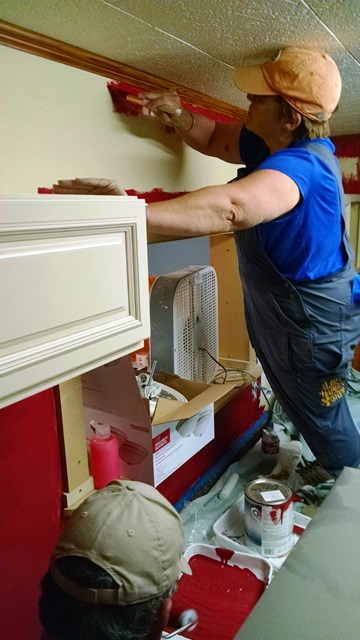 Lisa worked on painting the living room blue and later Mark and Lisa worked on the kitchen, crimson. The closet in bedroom #1 also got a final coat of paint today. 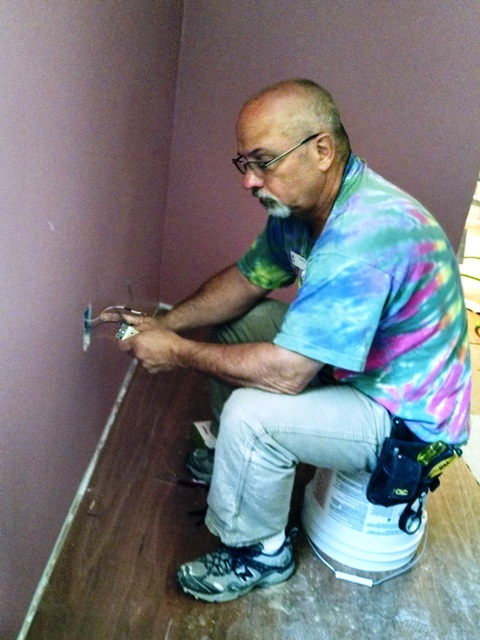 Dave worked on electrical and installing the base plugs. Max bounced around doing lots of things including applying leveling compound in the transition areas in preparation for the flooring installation. He also reinstalled some trim in the living room. There was also a good deal of cleanup and sorting of tools and supplies. 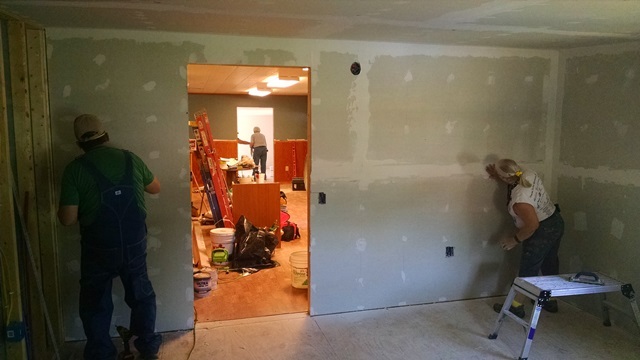 It’s time to return more items to the storage rooms at the church – another indication we are getting close to the end. Flooring is the biggest job we have left. Then, there are a lot of little things remaining. We would love to complete the painting so we can get on to the floor. We shall see. It was another warm sunny day in Baton Rouge. Don’t know the actual high but it was close to 90 this afternoon. They weather is just repeating itself each day and we aren’t complaining. Stel and Jodi brought us a good devotion for today based on Col 3:12-17. They reminded us to keep God in view even in the most difficult or menial tasks. Do everything we do for God. 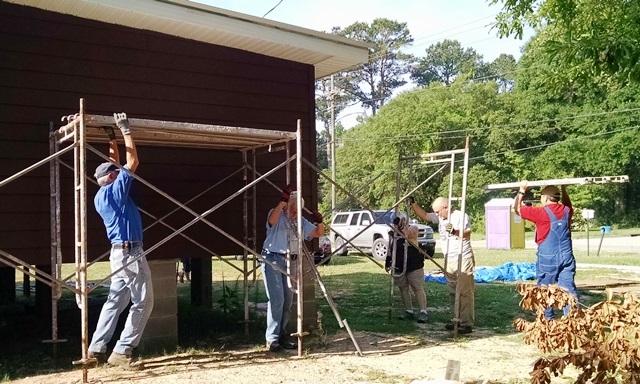 When we got to the job site our first task was to take down the scaffolding from the rear of the house, and move it to the front for transport back to the church. It sure came down much easier than it went up the first time. After that it was back to the tasks of yesterday. Mark started with more sanding in bedroom two. 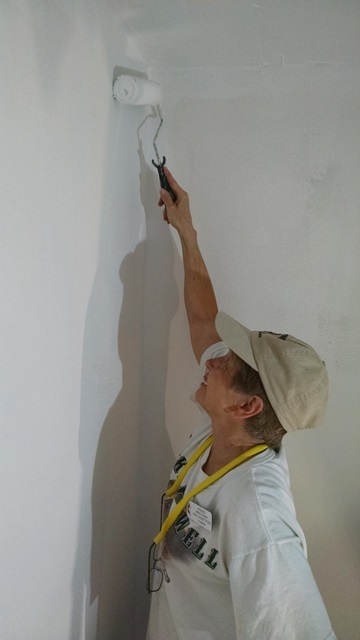 Stel and Anne started with texturing the ceilings in the closet and bathroom for bedroom two. 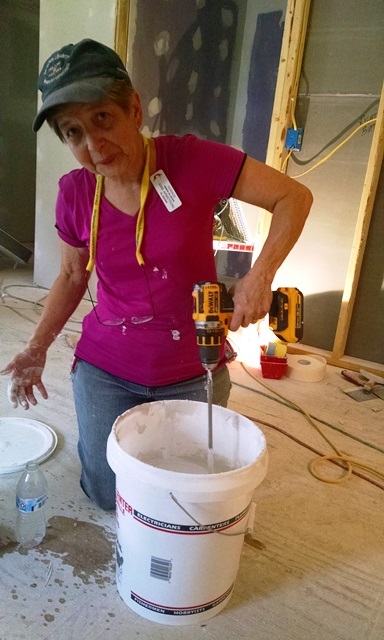 They had to first mix the drywall mud to the proper consistency and do a little experimenting until they got the look they wanted. The first room was a little slow but the larger bathroom went pretty fast. We are pleased with the results. 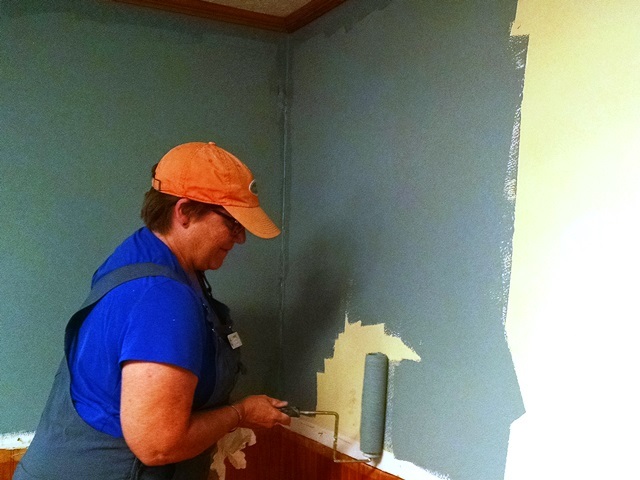 Carol and Lisa started with completing the painting in bedroom one. They also got the second coat on most of the room today. Max and Dave worked on building a shelf and installing the vanity top in bathroom one. It looks good. 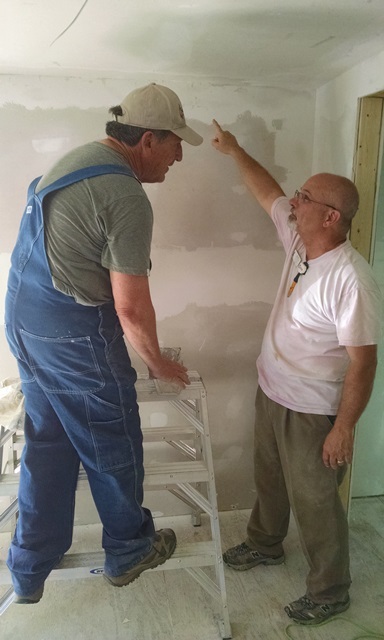 There was a lot of discussion about how to finish our bedroom two walls and ceiling. The drywall still needed a lot of work but if we used a light texture things would move much quicker and time is of the essence right now. Dave and Carol discussed options with Richard and he told us to move ahead. He and Sandy are very anxious to move into the house. The FEMA case manager really wants them in and out of the FEMA trailer by mid May-first of June. We hope that is possible. One of the holdups right now is the plumbing. The construction managers are working on that for us. Mark, Stel, Carol and Anne spent most of the afternoon texturing. 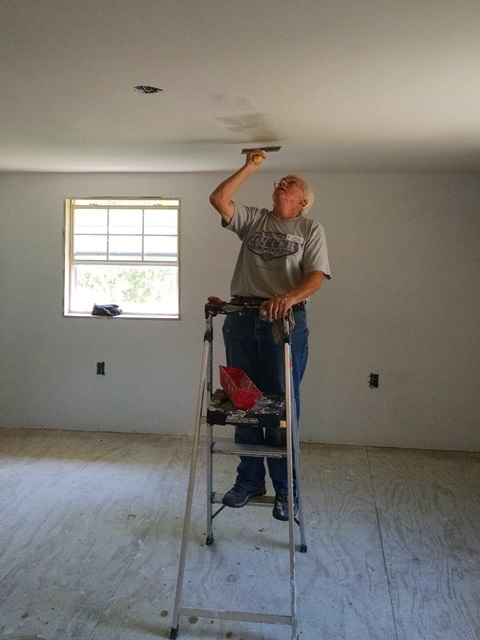 Mark put a light texture on the bedroom ceiling (and himself) completing the task just before the end of the day. 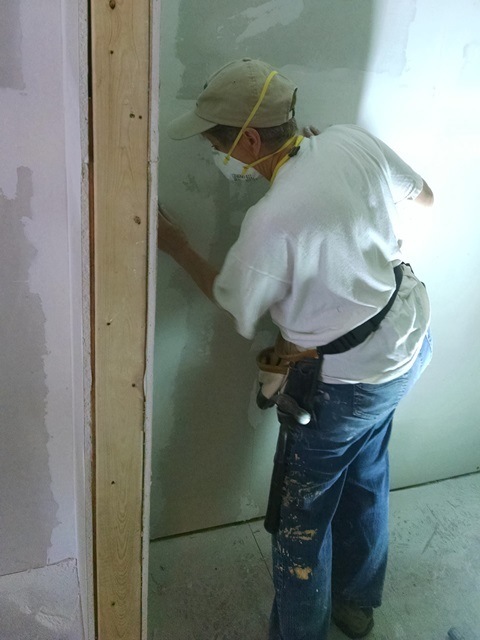 Stel put a light eggshell finish on the closet and bath walls. We are pleased with the results and think our homeowners will be as well. 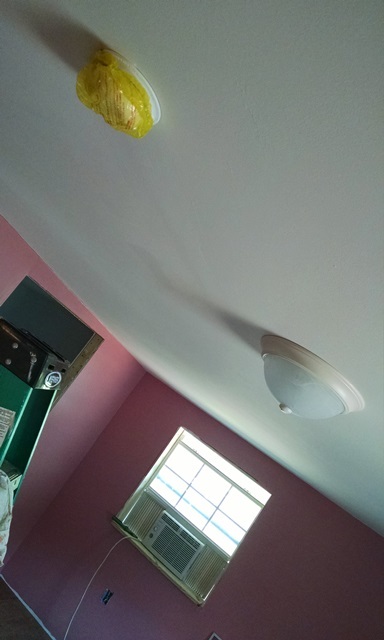 This afternoon Max also installed the light fixture and smoke detector in bedroom one. Wow! Makes it look so much better and so much more complete. 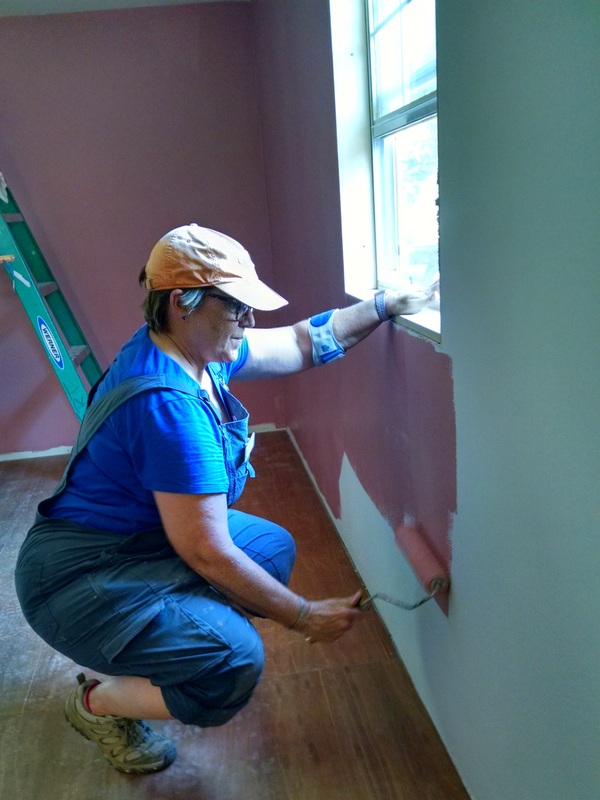 Carol did some touch up on the paint on bedroom one this afternoon. 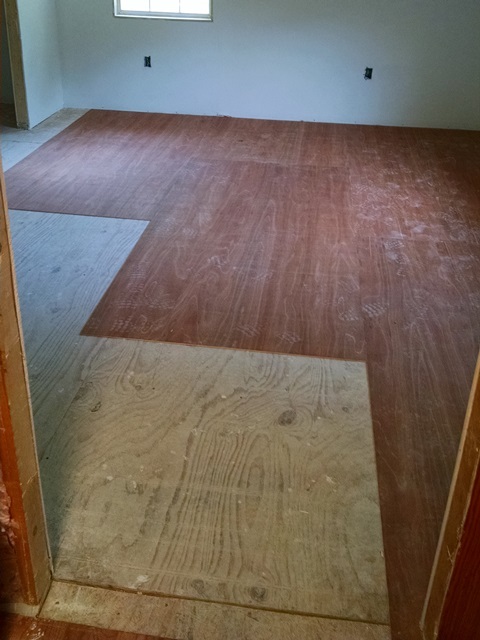 That room will be ready for flooring soon. Max also installed fixtures in the kitchen and closet. A real treat for us all was when Lisa arrived with some window air conditioners. She and Mark had some window units that were not in use so we will have a little cooler working conditions for the next few days. Thanks Mark and Lisa. So it was a very busy day and much was accomplished. But that wasn’t all we did today. 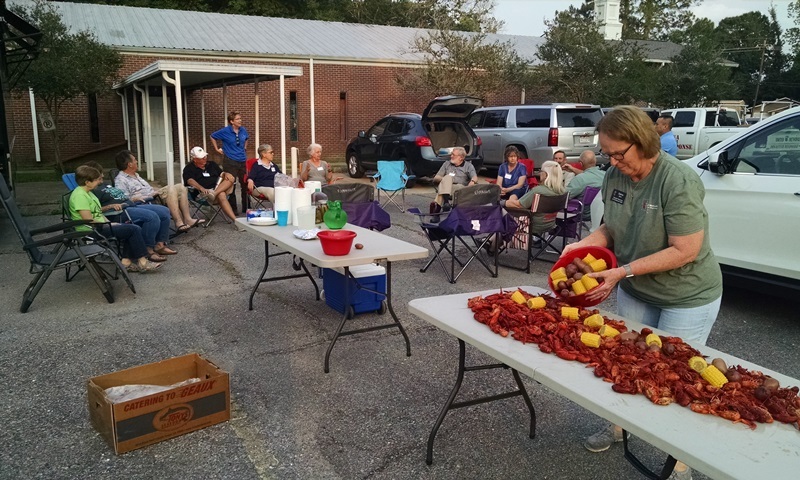 This evening the conference treated us to a wonderful crawfish (bug) boil in the parking lot. We visited and feasted with the volunteers from Colorado as well as Pastor Laraine and Debra from the conference office. It was crawfish, corn,potatoes and sausage. There was also some baked chicken for folks that weren’t up for the crawfish. Lisa gave everyone lessons on how to peel and eat the little critters. A good time was had by all and most of us enjoyed the crawfish. 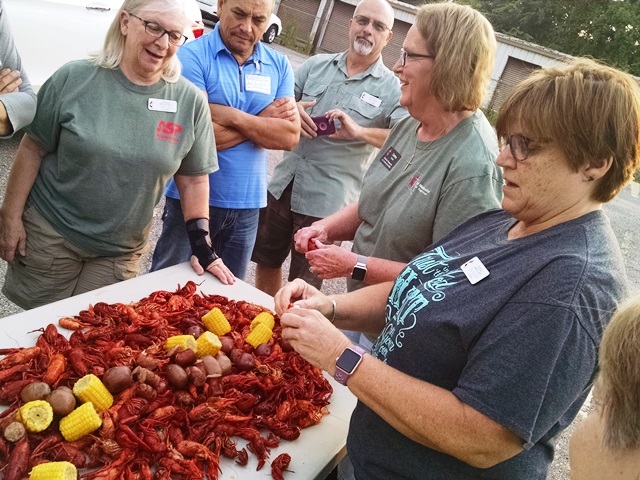 That table contains half of the 40 pounds of bugs (crawfish) brought for the volunteers. Tomorrow will be another busy day as we push through to complete this project. 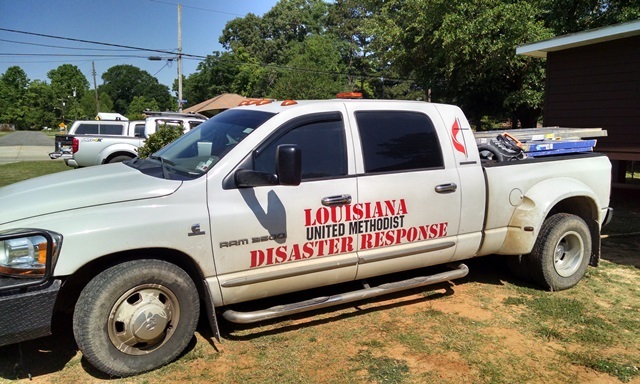 Please pray for our continued safety and that we will accomplish what the Lord wants us to accomplish. First of all, thanks to those of you who have made recent comments on the blog. We love hearing from you and when appropriate we share responses with the team. They always love hearing from fellow NOMADS and friends. Today was pretty much a carbon copy of yesterday only it seemed a little more humid. We brought devotion to the team this morning and used one of the Seedbed devotions from the study on John back on March 21, 2017. The title was “Why Jesus Must Be More Than the Solution to Our Problems”, from John 6:30-37. It seemed to be well received and sparked some discussion. The focus was that sometimes we look for solutions when we need a Savior. Jesus is not God’s solutions to all our problems. He is God’s gift of himself to us. We need to entrust ourselves completely to Him. 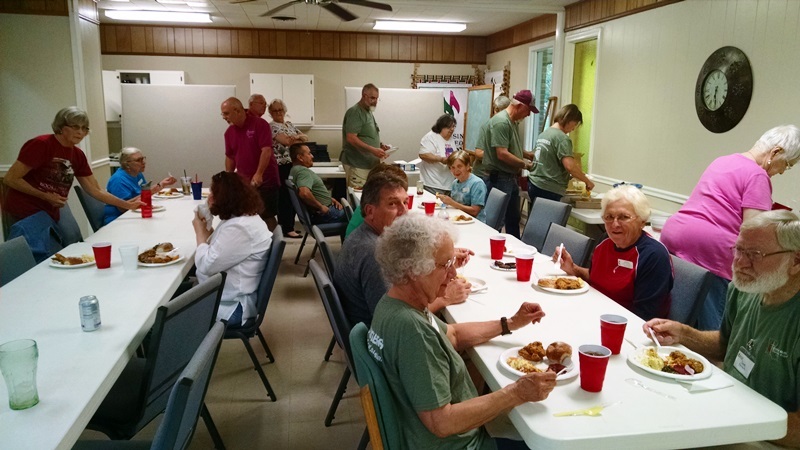 After devotion and a brief team meeting, we ran into Pastor Laraine in the kitchen and were able to talk to her about NOMADS returning to Baton Rouge next February. It was great to see Loraine even for just a few minutes. We then made the drive to Baker and began work again, where we left off yesterday. 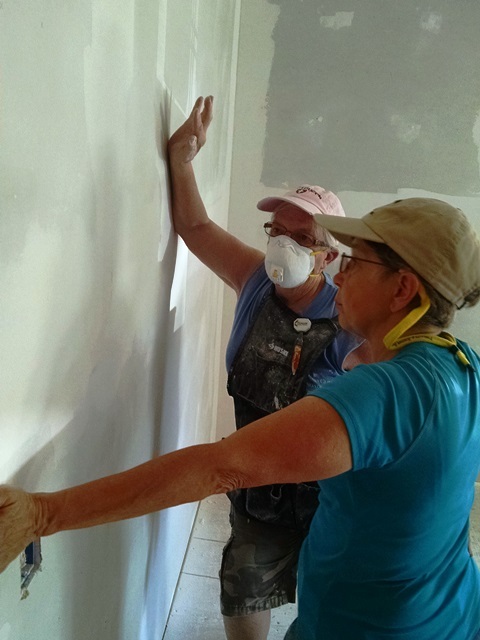 Stel, Anne, Carol and Mark worked on sanding and finishing the drywall. Mark also helped with unloading the flooring. Lisa painted the bathroom and later started in the bedroom. Max worked on more underlament, unloaded flooring, loaded the truck with tools we no longer needed for return to the tool room and some general cleaning. 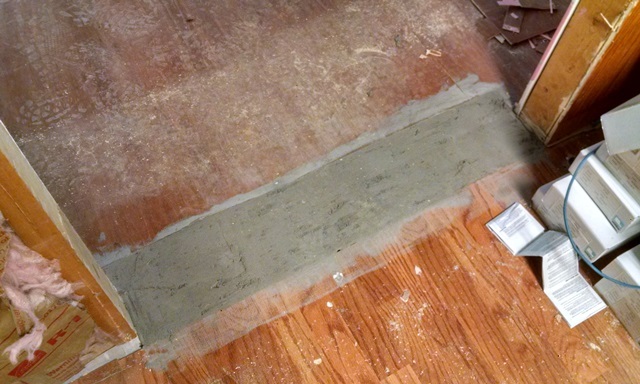 Dave unloaded the flooring, and did some general cleaning, and worked in the bathroom on the vent fan, counter top and trim. We are making what sometimes seems slow progress but we can definitely see the end in sight. 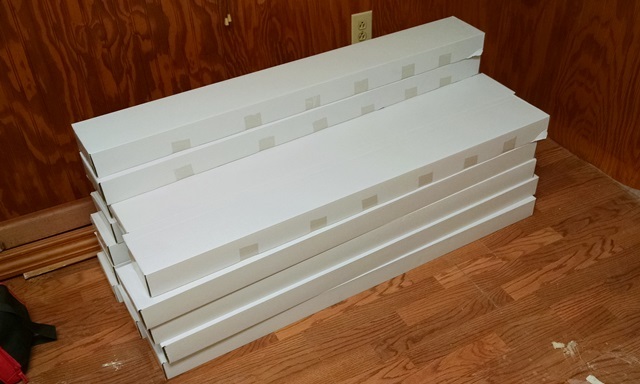 The flooring was delivered today. It will be exciting to start that portion of the job because that means the end is near. We so want to see Richard and Sandy back in their home. We will be close. Stel didn’t work this afternoon because she had to take Jodi back to the doctor. They removed the staples and discharged Jodi. Thank you, God! She still has to take it easy for a few more weeks but can be more active and has no travel restrictions. We, of course, hope they will stay another week until the end of the project. They are on their eighth week here now and they would also like to see Richard and Sandy in their house, but they also have been away from home a long time. It will be a hard decision for them to make. After we all got back to the church this afternoon, we got together for root beer floats. It was a nice cool treat to end a hard, hot day of work. Drywall dust in the ears, drywall dust in the nose, drywall dust in the hair, drywall dust everywhere! Today was another beautiful day in Baton Rouge. It was also pretty hot, 89. But we are working inside and it wasn’t too bad. Of course the day started with morning meeting and devotion. We are working out at Richard’s so we started at 7:30 since it takes a while to get out to Baker. When we arrived we were all smiles. The house looks great! 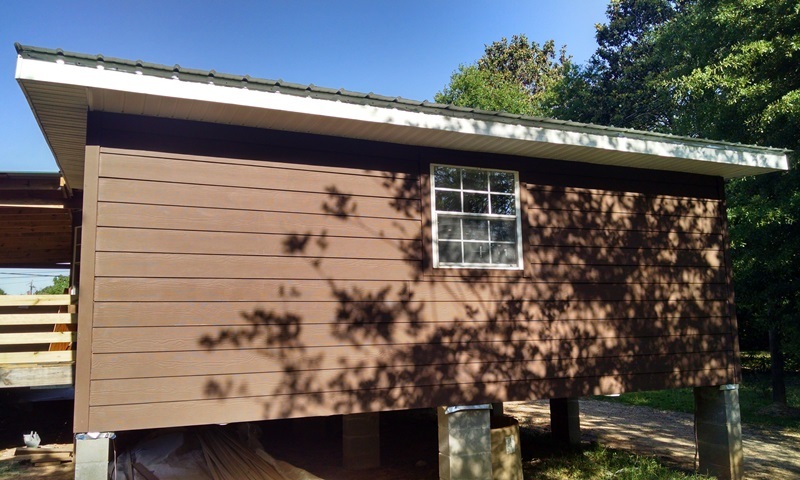 Suzanne and her various crews did an awesome job on the siding. The inside is looking good too. 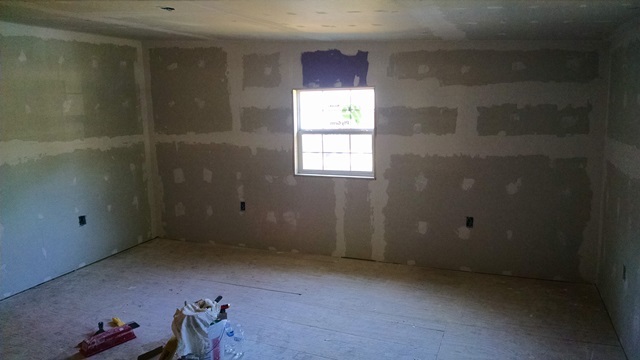 Since we left, the drywall has been installed, the shower in the master bath installed, a bathtub has been installed in the second bath. The master bedroom got a coat of Kilz last week and the second bedroom, bath a closet had part of the drywall tape and mud applied. 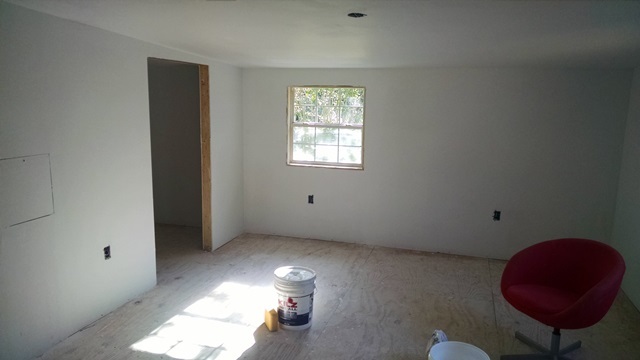 Part of the living room and kitchen have been painted. It is starting to look really good. Today we all worked really hard. 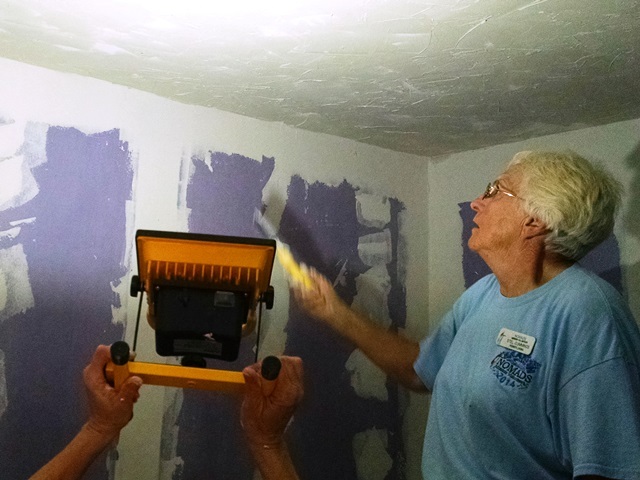 Stel and Lisa began the day in the master bedroom area, painting the ceiling. 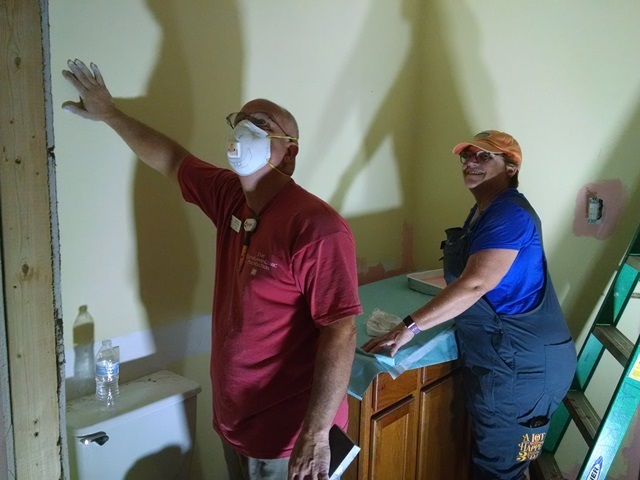 Later Lisa painted the master bath and Stel did some drywall work. 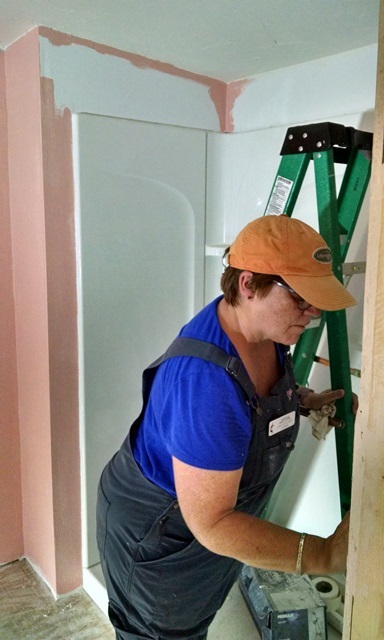 Carol, Anne, Max, and Mark worked in the second bedroom, bath and closet most of the day. 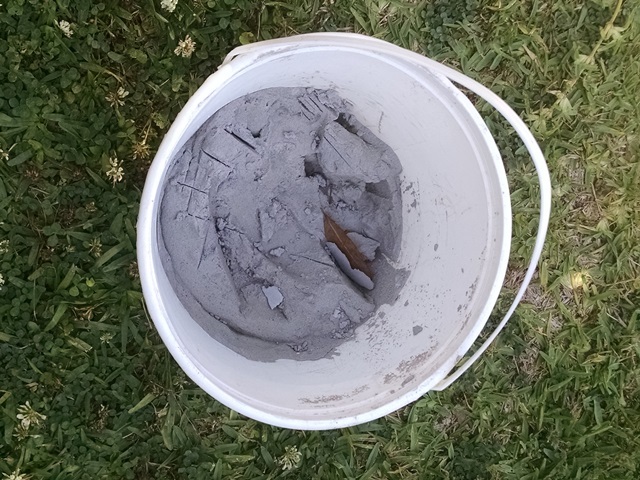 There was a lot of sanding to do. There was drywall dust in the ears, drywall dust in the nose, drywall dust in the hair, drywall dust everywhere! Yes, we wore masks. 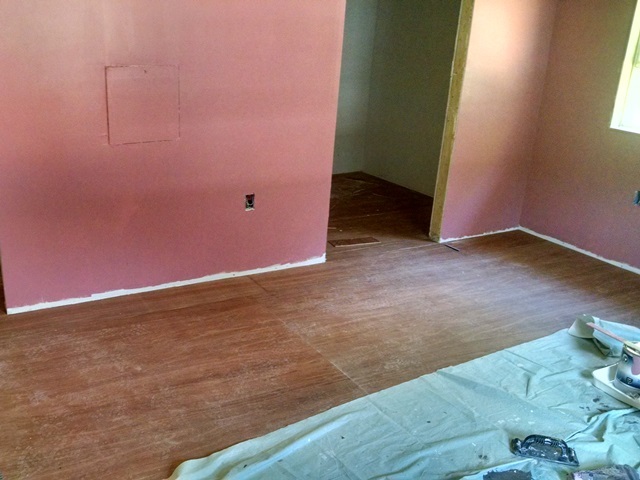 Max and Dave began installing some underlayment in the master bedroom late this afternoon. Max and Dave also worked on determining what trim we need. We got to visit with Richard and Sandy and it was great to see them again. 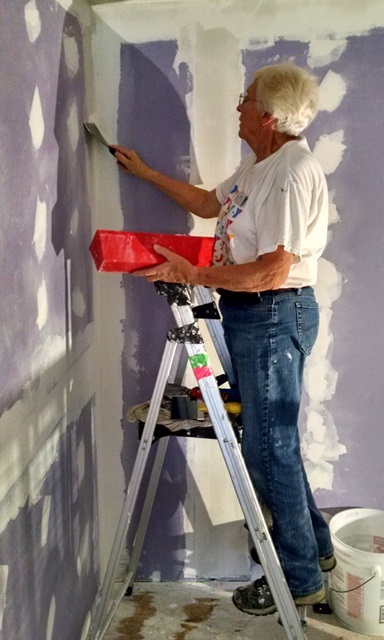 Sandy was really pleased to start seeing the paint on the walls – paint she selected. There is still an awful lot to do and we only have two weeks left on this NOMADS project. We are working hard to complete the house. Hopefully we will get it done. 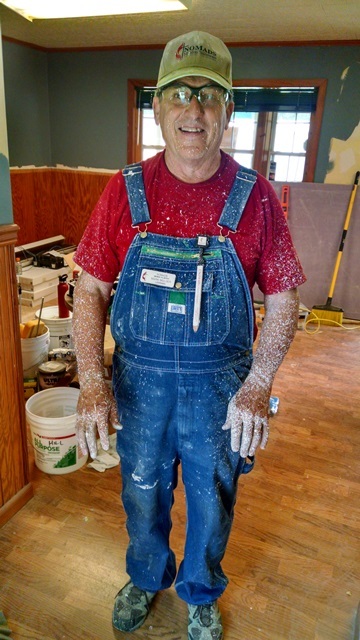 Author rvingwithapurposePosted on May 7, 2018 1 Comment on Drywall dust in the ears, drywall dust in the nose, drywall dust in the hair, drywall dust everywhere! Today was a beautiful sunny late spring, early summer day in Baton Rouge. It was quite warm with only some scattered puffy clouds. Looks like the upcoming week is going to be hot with highs of 86-88 each day and no rain predicted. We slept in a little since church isn’t until 10:30 at Francis Asbury UMC. The congregation was again very welcoming and thanked us for returning to work again. The church was full today, with very few empty seats. 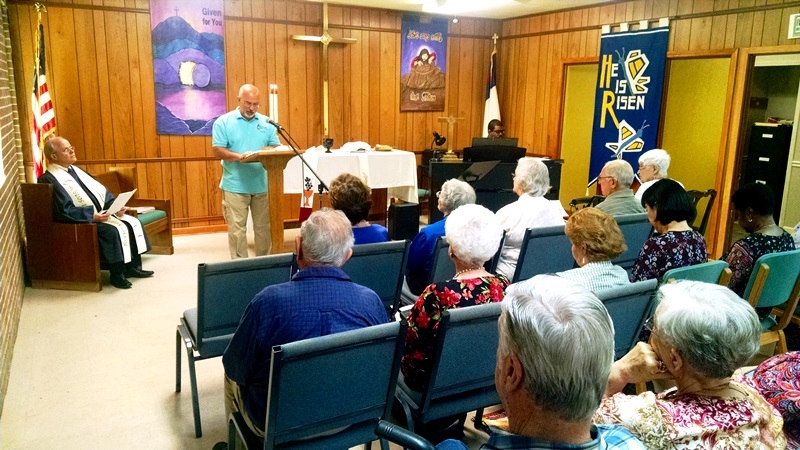 Pastor David’s message was “We Gather Together”, based on Luke 24:30-31, 35 which our leader Dave read, and Luke 24:36-43 and John 21:7-13 read by members of the congregation. After the message we shared in communion. Dave had invited David and his wife Melanie to joined us for lunch. We went to the Jones Creek Cafe, a new restaurant for us. We had crab cakes which were really good. Everyone seemed to enjoy their food and we would definitely return. Fortunately, the restaurant wasn’t really busy today because we stayed there visiting with the entire team and David and Melanie until almost 2:00. We returned to Fred to relax for a few minutes and then headed to the grocery store. We needed food for lunches tomorrow and fresh fruit and salad makings. Mark and Lisa had arrived when we returned. It is so good to be spending time with them again. We just enjoy them so much. We got to meet their other puppy, Dallas today. Such a beautiful puppy. He is a two year old golden-doodle, silver. Yep, we are missing our Scout. It was also good to see that Annie, their older dog, is doing great since her diabetes diagnosis when we were here before. She looks so much better. We had team meeting at 5:00 and Carol prepared a light supper for us all. She had home-made sloppy joes and we have requested the recipe. Of course, it was all so good with pineapple cheesecake for dessert. Thanks so much, Carol. It was a good meeting with lots of laughter – surprise, surprise. Looking forward to a good week with lots accomplished for Richard. 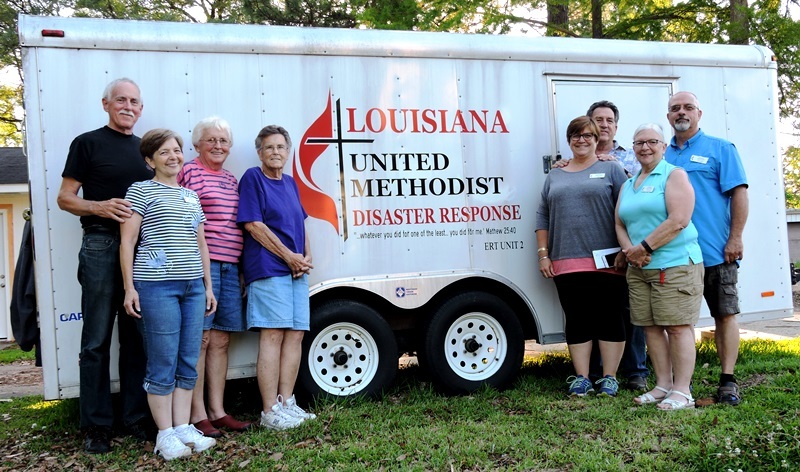 Please keep us in your prayers for safety, and that we will accomplish in the place what God wants us to accomplish. We apologize for not posting for the past three days. Briefly, we continued to do accounting and estate business for two of those days and then Friday was another LONG day, again visiting four banks, the assisted living and Aunt Helen and Aunt Jean. (We did take time to walk back down to Cookout for a milkshake last night.) For those that haven’t heard, Jean and Helen have been moved to long term care at the rehab center and are now sharing a room, 306. We don’t know how that will work and they are both on the wait list for private rooms. Please pass the word along about the room change. While we were at the banks Friday, we struck up a conversation with the lady helping us. We told her about the work we do with NOMADS and RVing with a purpose. It was then that she told us that she and her husband had hoped to travel in their RV too. 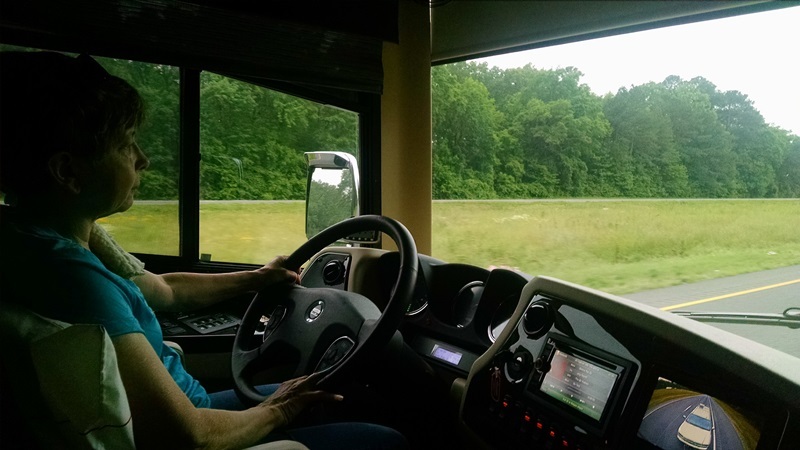 They had bought a brand new trailer and in December were loading it out for their first trip when he died suddenly of an aneurysm. Very sad story of a very sweet lady. She is now trying to sell the trailer because she never learned to tow it and doesn’t want to try to travel alone. If you know anyone in the market, we know where they can buy a 32 foot 2018 Keystone Springdale with one slideout for a good price. Today we are on the road again! We left Tuscaloosa about 6:50 this morning in route back to Baton Rouge. We stopped at the Mississippi and Louisiana welcome centers for a breakfast and breaks and arrived early afternoon. It was a very cloudy drive with an occasional drizzle. We noticed that as soon as we crossed into Mississippi, the magnolia trees had beautiful blooms. So pretty. Not so pretty – the love bugs are everywhere right now. We were hoping for a good rain before we arrived but it didn’t happen. Max had to wash the windshield and front cap this afternoon before the sun is back out tomorrow. Our dear friends, Carol and Dave, our leaders for the next two weeks, greeted us on arrival. We went to a late lunch/early supper together and started getting caught up. Looking forward to working with them the next few weeks. Stel and Jodi are also still here in Baton Rouge and it was wonderful to see them as well. Jodi is still weak from her surgery but says she is getting stronger. She still needs our prayers but it was so good to see her out and about. Mark and Lisa who were also here when we were here a few weeks ago will arrive tomorrow afternoon. Dave and Carol think we will all be working back out at Richard’s house all week. Looking forward to seeing the progress that has been made while we were gone. Don’t forget to be in prayer for services tomorrow. We are looking forward to worshiping at Francis Asbury UMC again tomorrow. 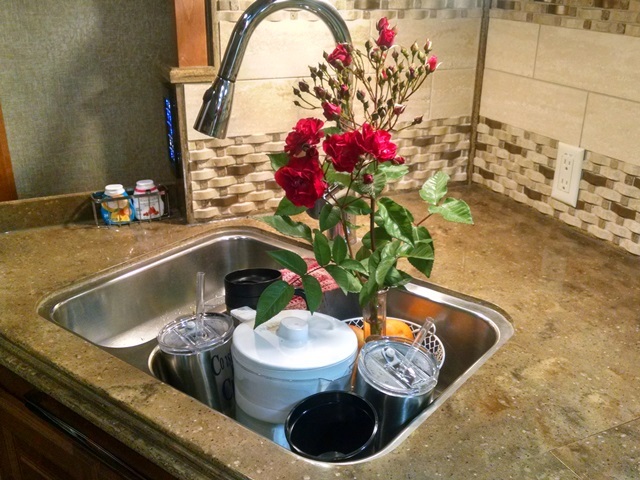 The roses were blooming at our house and we didn’t want to miss them all, so we figured out a way to bring some with us. 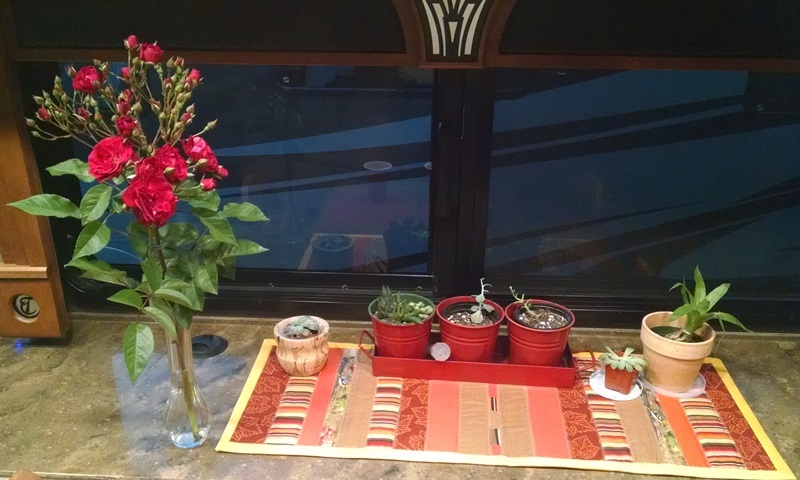 Our traveling garden. Don’t laugh. 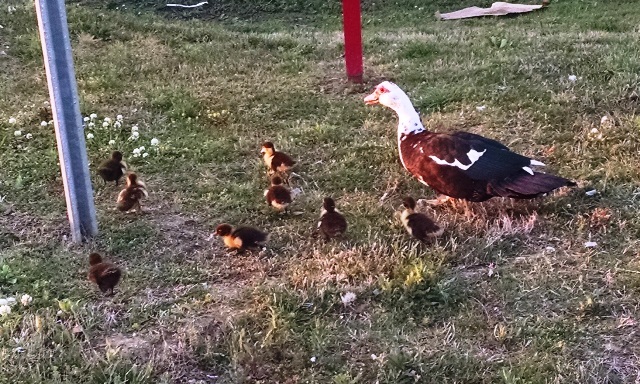 Today was another day of estate and tax work, but we did see these cute ducklings on our evening walk to get milkshakes. Author rvingwithapurposePosted on May 1, 2018 Leave a comment on Duck!